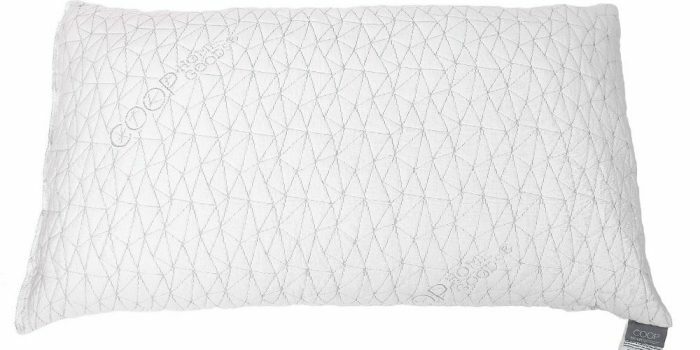 The shredded adjustable memory foam pillow by Coop Home Goods is what its name suggests. The pillow has been crafted keeping the uniqueness of every individual in mind. Some like it fluffy, full, and big, whereas some prefer it compact. The flexible stuffing allows the user to adjust the girth of the pillow. The foam (or the stuffing) is stripped down to smaller bits which ensure good ventilation. 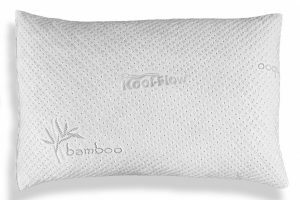 The bamboo polyester blended fabric and the shredded stuffing regulate the temperature and keep the pillow cool and sweat free. 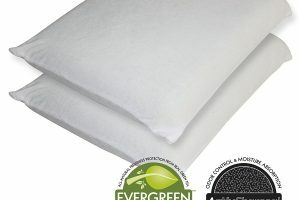 No environmentally degrading chemicals or materials have been utilized to fabricate the Coop Home Goods Adjustable Shredded Memory Foam Pillow. Based on customer reviews on Amazon it is currently one of the top-selling product in the “Pillow” department. The overall rating of the product is definitely A+. The product can appear to be a bit pricey for some customers, but the 5-year warranty which comes with this expensive pillow compensates for the high price. The adjustable padding is something novel and lets you experiment until you find your niche position. Overall it should be a good investment. There are quite a few alternatives available on the market for the price you would pay for a Shredded Memory Foam Pillow. Many customers might find the cost of this product a bit too much. Besides, this pillow isn’t the best pick for the side sleepers. But the good news is that Coop Home Goods manufactures a kind of pillow specifically designed for side sleepers. The Beyond Down Gel Fiber Side Sleeper Pillow is crafted for side sleepers. It comes with polyester gel, or fiber filling, which provide the much-needed neck support for side sleepers to avoid cramps in your neck the morning after. The material used for stuffing also prevents any potential allergens from spreading. And it costs almost half the price of Shredded Adjustable Memory Foam Pillow. The Super Plush Gel-Fiber Filled Pillow is also a good option. A pack of 2 comes for a decent price. The fluffy, soft, yet firm quality of the pillow is something much talked about among its existing users. It is fabricated with 100% cotton. The gel-fiber filling prevents any sort of allergens from taking over and is also recommended for asthma patients for the same reason. An antibacterial and antifungal coating on the pillow case inhibits the unwanted microbes from beefing up. According to the user rating, the product falls in the B+ category. Analyzing the Adjustable Shredded Memory Foam Pillow against the above-mentioned alternatives, the main difference seen is the price you pay for it and the comfort offered. While Adjustable Shredded Memory Foam Pillow might not be the preferred option for side sleepers, Beyond Down Gel-Fiber Side Sleeper Pillow is something you might want look into. 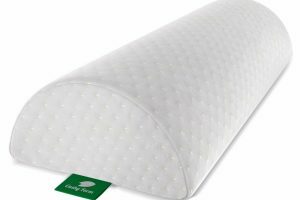 But considering the ratings and customer reviews, Shredded Adjustable Memory Foam Pillow definitely stands out from every other pillow currently available on the market. This explains why it is one of the best-selling products right now. 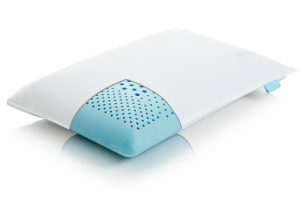 The Adjustable Shredded Memory Foam Pillow is designed to give you a deep sleep so that you feel rejuvenated and fresh when you wake up in the morning. The materials which compose this product are low carbon emission materials and chemicals. This not only means that its carbon footprint is low, but it will also keep the indoor air quality clean and suitable for all the residents of the house. 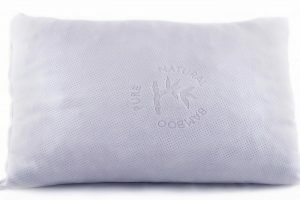 The bamboo-derived viscose rayon and polyester cover ensures that your pillow is as cool as you, and well-ventilated at all times. This prevents your pillow from heating up while you are using it. 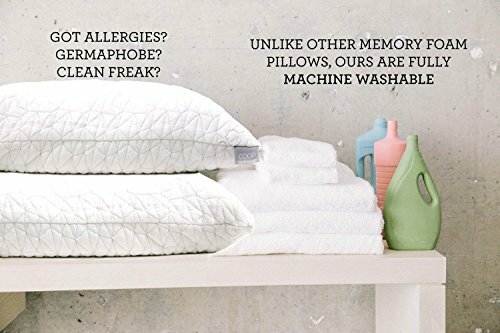 The engineered fabric is also hypo-allergic which keeps your pillow dust-free and free of mites. Get the perfect pillow for yourself as per your requirement. The adjustable stuffing is a stand out feature of this product which not many other contemporary pillows offer. Being designed and fabricated in the U.S.A., it guarantees you with the best quality and standard you can ask for. It’s easy to maintain the pillow since you can wash it in the machine and it will not degrade the softness and texture of the pillow case.